There is a large parking lot along the east side of the building. If you have difficulty climbing stairs please give us a call at 612-440-6985 so we can assist you with the elevator. The following Conditions of Sale and Terms of Guarantee constitute the entire agreement with the purchaser relative to the property listed by Revere Auctions LLC. Hereinafter, Revere Auctions LLC is referred to Revere Auctions. Revere Auctions acts as owner or as an agent for various owners and consignors. Revere Auctions reserves the right to change the terms of sale by oral announcement. Any such change shall become part of the Condition of Sale. By bidding at auction (whether present in person, by agent, by telephone, by absentee bid instruction, or though a live internet bidding platform) you agree to be bound by these terms. Prospective buyers are strongly advised to personally examine any property in which they are interested before the auction takes place. Condition reports are usually available on request, on lots with a low estimate of $500 and above. All lots are sold 'AS IS' and without recourse and neither Revere Auctions, nor its consignor(s) makes any warranties or representations, express or implied with respect to such lots. Revere Auctions makes a limited warranty only to the original buyer of record concerning the authenticity of each lot for a period of 14 days after bidder's receipt of the purchased lot. If a buyer is not satisfied that the lot purchased is genuine, the buyer may, at his or her own expense, obtain the opinion of two mutually agreed upon recognized experts in the field of the disputed lot. If these experts determine that the item is not genuine, the buyer's sole and exclusive remedy shall be the rescission of the sale and refund of the amount paid for the item. It is specifically understood and agreed that the rescission of the sale and refund is exclusive and in lieu of any other remedy which might otherwise be available as a matter of law or in equity, and such remedy is conditioned upon the buyer returning the property in the same condition as at the time of sale. Revere Auctions shall not be liable for any incidental or consequential damages. All sales are final, with no returns or refunds except as provided in this limited warranty. The limited warrantee does not extend to the lots identified as attributions, school, circle, manner, or after. 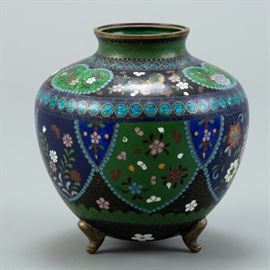 Some of the lots in this sale are offered subject to a reserve, which is the confidential minimum price below which the lot will not be sold. A reserve shall not be greater than the low estimate of the lot. A representative of Revere Auctions will execute such reserves by bidding on behalf of the consignor. Revere Auctions in its sole and exclusive discretion, reserves the right to withdraw any property, at any time, before the fall of the hammer. A buyer's premium will be added to the hammer price and is payable by the purchaser as part of the total purchase price. The buyer's premium is 25% of the hammer price. An additional fee will be charged on any purchase made using live online bidding. 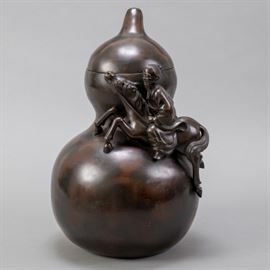 Those bidding live online or leaving absentee bids on Invaluable.com, liveauctioneers.com or any related site will pay an additional fee of 3% on the total hammer price of successful purchases. All purchases regardless of bidding method are subject to the Buyer's Premium and appropriate Sales Tax. The highest bidder acknowledged by the auctioneer shall be the buyer. The auctioneer has the right to reject any bid, to advance the bidding at his absolute discretion and in the event of any dispute between bidders, the auctioneer shall have the sole and final discretion either to determine the successful bidder or to re- offer and resell the article in dispute. If any dispute arises after sale, the Revere Auction sale record shall be conclusive in all respects. 7 If the auctioneer determines that any opening or later bid or any advance bid is not commensurate with the value of the Property offered, he may reject the same and withdraw the Property from sale. Upon the fall of the hammer, title to any offered lot or article will immediately pass to the highest bidder as determined in the exclusive discretion of the auctioneer, subject to compliance by the buyer with these Conditions of Sale. Buyer thereupon assumes full risk and responsibility of the property sold, agrees to sign any requested confirmation of purchase, and agrees to pay the full price, plus Buyer's Premium, therefore or such part, upon such terms as Revere Auctions may require. Title in a purchased lot will not pass until Revere Auctions has received in full the total purchase price in cleared funds. Unless exempted by law, the purchaser will be required to pay Minnesota state sales tax as applicable, any applicable local sales tax, and any applicable compensating use tax of another state. Sale tax will not be collected on any lot that is shipped out of state. Revere Auctions accepts checks (personal or business check in US dollars certified by a US bank, a cashier's/banker's check drawn on a US bank or US money order), cash (US currency not to exceed $10,000 in a single or multiple related payments). Visa, Discover, American Express or MasterCard may be used and are subject to a 2.5% convenience fee. The purchaser's obligation to pay immediately the full purchase price is absolute and unconditional and is not subject to any defenses, setoffs or counterclaims of any kind whatsoever. Revere Auctions is not obligated to release a lot to the purchaser until title to the lot has passed. The purchaser agrees to pay Revere Auctions handling charge of $30 for any check dishonored by the drawee. For lots with an associated “(Bitcoin Accepted)” descriptor or "₿" symbol, Revere Auctions will accept Bitcoin as a form of payment. If the lot does not have an associated icon underneath a lot, the company will not accept payment in the form of Bitcoin for said lot. No other forms of cryptocurrency will be accepted, and if you wish to pay using a digital coin, you must transfer your holdings into Bitcoin before processing your payment. Revere Auctions still requires that you register individually with the company for the auction, and no payment will be accepted without such registration. All transactions will be expected to be fulfilled in U.S. Dollars, and any payment via Bitcoin must meet the sell price of the lot in USD. If a transfer of Bitcoin occurs, and the amount received by Revere Auctions does not meet said sell price, Revere Auctions retains the right to withhold the lot until the correct amount has been accounted for. Property purchased from Revere Auctions by a successful bidder will not be released to such bidder until the full payment of the total purchase price (including the buyer's premium and online bidding service fee, and all applicable sales taxes) have been made. In addition to other remedies available to us by law, we reserve the right to impose from the date of sale a late charge of 1.5% per month of the total purchase price if payment is not made in accordance with these conditions. Please note that Revere Auctions reserves the right to refuse to accept payment form a source other than the buyer of record. The purchaser must remove all property from the auction premises at his/her expense the day following the auction. If the property is not picked up within 10 days of the auction, Revere Auctions reserves the right to charge a minimum storage and handling charge of $20 per lot per day. Revere Auctions also reserves the right to send the property to a public warehouse for the account and at the risk and expense of the purchaser, to be released only after payment in full of all removal, storage, handling, insurance and any other costs incurred, together with payment of all other amounts due to us. It is the purchaser's sole responsibility to arrange to collect or ship the property and to identify and obtain any necessary export, import, firearm, endangered species or other permit for the lot. Revere Auctions and the consignor make no representations or warranties as to whether any lot is or is not subject to export or import restrictions or embargoes. Purchasers are reminded that Revere Auctions liability for loss or damage to sold property shall cease no later than 10 days after the date of the auction. If the purchaser fails to fulfill or comply with any of the conditions herein, the purchaser shall be in default and, in addition to all legal remedies available to the Revere Auctions and the consignor by law, including, without limitation, the right to hold the purchaser liable for the total purchase price, including all fees, charges and expenses more fully set forth herein, Revere Auctions, at its option, may: a) cancel the sale of that, or any other lot or lots sold to the defaulting purchaser at the same auction or any other auction, and retain all payments made by the purchaser as liquidated damages; b) resell the purchased property whether at public auction or by private sale, for the account of the purchaser, in which case the purchaser shall be liable to Revere Auctions for all its costs and damages, including the commissions for both auctions; c) remove the property to a public warehouse for the account and at the risk and expense of the purchaser; d) charge interest at such rate as we shall reasonably select, or e) effect any combination thereof. In any case, the purchaser will be liable for any deficiency and any and all costs, handling charges, late charges, expenses of both sales, our commissions on both sales at our regular rates, legal fees and expenses, collection fees and incidental damages. Payment will not be deemed to have been made in full until we have collected good funds. In the event that purchaser fails to pay any or all of the total purchase price for any lot and Revere Auctions nonetheless elects to pay the consignor any portion of the sale proceeds, the purchaser acknowledges that Revere Auctions shall have all of the rights of the consignor to pursue the purchaser for any amounts paid to the consignor, whether at law, in equity, or under these conditions of sale. In addition, defaulting purchaser will be deemed to have granted and assigned to Revere Auctions a continuing security interest of first priority in any property or money of or owing to such purchaser in our possession, custody or control, in each case whether at the time of the auction, the default or if acquired at any time thereafter, and we may retain and apply such property or money as collateral security for the obligations due to us. The copyright in all images, illustrations and written material produced by or for Revere Auctions relating to a lot, including the contents of this catalogue, is, and shall remain at all times, the property of Revere Auctions and shall not be used by the buyer nor by anyone else, without our prior written consent. Revere Auctions reserves the right to reproduce any image of the lots sold in this catalogue. The rights and obligations of the parties with respect to these Conditions of Sale, the conduct of the auction and any matters connected with any of the foregoing shall be governed and interpreted by the laws of the jurisdiction in Minnesota. If any part of these Conditions of Sale is found by any court to be invalid, illegal or unenforceable, that part shall be discounted and the rest of the conditions shall continue to be valid to the fullest extent permitted by law. 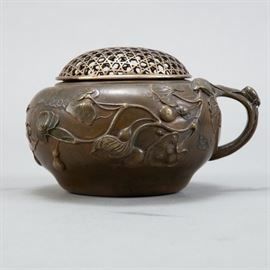 A striking Japanese Meiji era mixed metal censer decorated with applied silver and copper. Signed on bottom Kotaro (Kotarou) Saku Tsukuta. 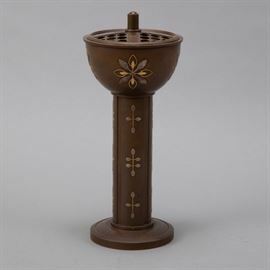 Dimensions: Height: 11 in x diameter: 5 3/4 in. 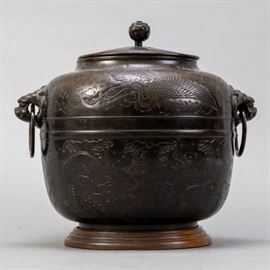 An excellent Japanese Meiji bronze container with lovely deep red patina. In an oval form. 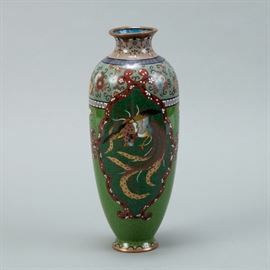 Surfaces bear incised dragon and phoenix motifs. Likely an element of the tea ceremony. 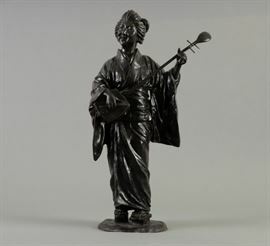 Dimensions: Height: 12 in. 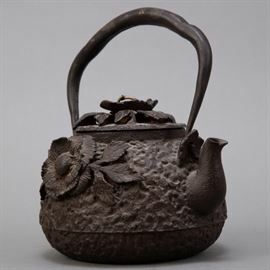 A lovely well made iron teapot decorated with applied flowers. Inlay in handle. Dimensions: Height (including handle): 9 in x width: 7 in x depth: 5 in. 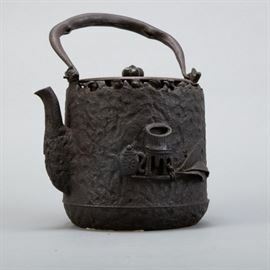 Japanese tetsubin iron kettle with an iron lid attributed to Ryubundo. Both sides have designs in high relief--one of flowers and the other of a tea scene. The kettle has a signature along the underside of the lid. Dimensions: Height (including handle): 9 1/2 in x width: 6 in x depth: 5 1/4 in. 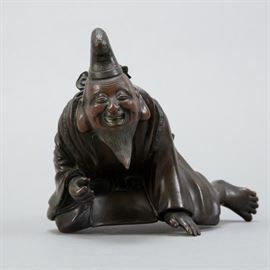 A Japanese bronze sculpture of a laughing immortal. Likely a piece of a larger sculpture. Dimensions: Height: 5 in x width: 6 1/4 in x depth: 5 1/4 in. 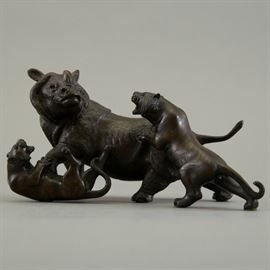 Japanese Meiji period cast bronze figural group of two tigers attacking a rhino. The animals are done with incredible detail. 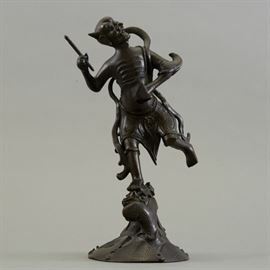 The bronze is signed Genryusai Seiya. Dimensions: Height: 5 in x width: 7 1/2 in x depth: 4 in.